Neon Staxx is a NetEnt based 5 reels and 40 Paylines slot game. The game has outstanding graphics and great animation. The sound of the game is awesome as well. Minimum coins per line are 1 and max coins per line are 10. Minimum coins size you can choose is 0.01. Play Neon Staxx Slot at NetEnt Casinos. There are four basic terms available in this game and they are “Level”, ‘Coin size”, “max bet” and “Auto Play”. “Level” option is used to choose the number of coins per line. “Coin size” is used to Set the coin denomination, “Max bet” option is used to play with the highest possible wager and “Auto Play” option is used when a player wants to play the game for a number of times without any interruption. 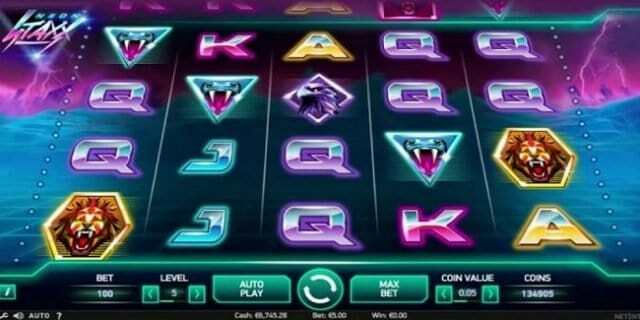 This is one of the retro casino slot game powered by NetEnt software and the wild symbol of the game can be substitute for all other symbols except the scatters. The SuperStaxx feature activated randomly in this game which can appear anywhere on the reel at any moment. When this feature activated the entire reel is stacked with just 1 symbol. When you land on three or more scatters on anywhere on the reels, free spin feature will be triggers. You could get 20 Free Spins for that reason. So, what are you looking for? Neon Staxx is one of the coolest casino slot game that we currently have these days. You should try your luck at any Net Entertainment online casinos, which offering this particular slot game.